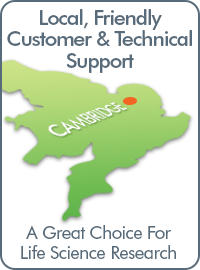 Cambridge Bioscience offers a highly accurate, well-established, multi-parameter analyser for cultured and primary cells. With a dynamic detection range from 0.7 up to 150 microns, the CASY® Counter can measure cell number and viability (without interference from dyes) of all cell types including algae, bacteria and yeast. The flexible, yet robust, methodology can also measure cell size distribution, cell aggregation and cell debris. Reproducible results are displayed in a single histogram, taking less than one minute per measurement, with no single-use counting chambers or slides necessary. Particles and cells passing through a defined size pore generate a resistance signal varying with their size and conductivity. Live cells with a polarised membrane generate a high resistance signal, whereas dying or dead cells display a much lower resistance due to their depolarised or fully disrupted cell membrane. The signal of one cell passing the pore is resolved with a high frequency of 1 MHz, and hence the area under the curve = the Integral can easily be calculated, the integral being the only parameter directly proportional to the cell size. 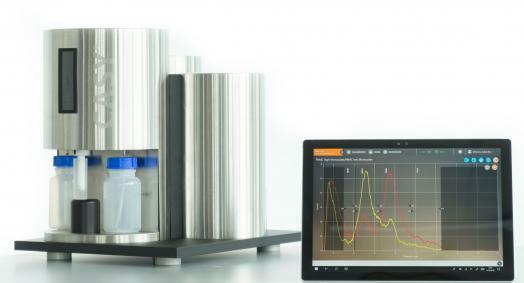 As the integral is different with live cells, dead cells and debris, the particle sizes and their distribution can be recorded and analysed very precisely. Cells are suspended in CASYton, an electrolyte developed specifically for cell counting. 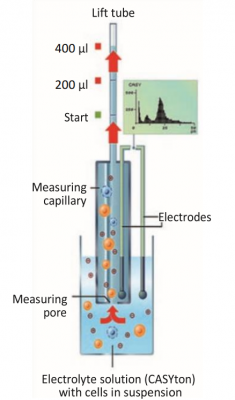 For the measurement, the cells are aspirated through a precision measuring pore of defined geometry at a constant flow speed. Encounter a wealth of new possibilities with brand new software for CASY. Included as standard with new instruments with the opportunity to upgrade some older models. Contact our OLS Specialist to request further information or a demo here.